Racing is certainly exciting for the person rocketing around the track fast enough to get the speedometer into the triple digits, and tends to be a decent thrill for the spectators if they’ve got good seats. But if you’re just watching raw race videos on YouTube from the comfort of your office chair it can be a bit difficult to appreciate. There’s a lack of context for the viewer, and it can be hard to get the same sense of speed and position that you’d have if you saw the event first hand. In an effort to give his father’s racing videos a bit more punch, [DusteD] came up with a clever way of adding video game style overlays to the recordings. The system provides real-time speed, lap times, and even a miniature representation of the track complete with a marker to show where the action is taking place. The end result is that recordings of Dad’s exploits on the track could pass as gameplay footage from Gran Turismo (we know GT doesn’t have motorcycles, but you get the idea). The first part of the system is the tracker itself, which consists of a GPS receiver, an Arduino Pro Micro, and an SD card module. [DusteD] powers the device with two 18650 cells in parallel, and a DC-DC boost converter to step it up to 5V. 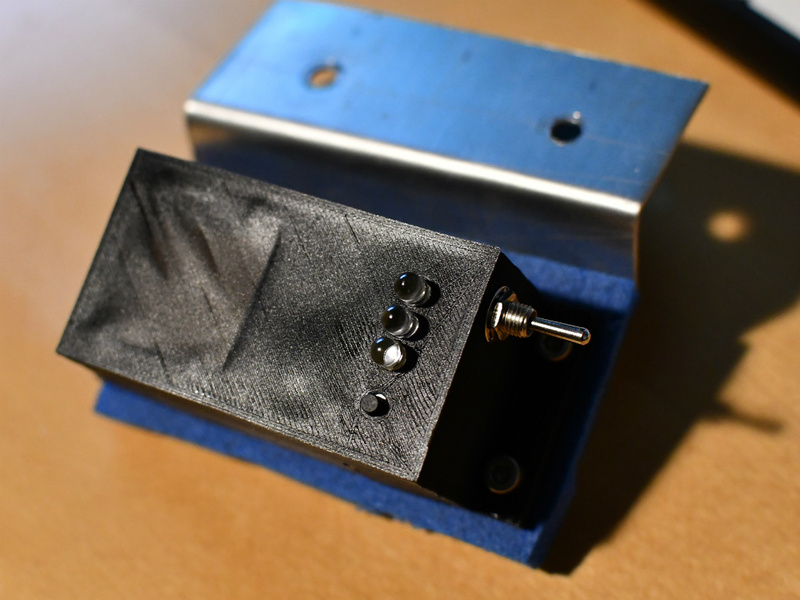 Everything is contained in a 3D printed enclosure that he designed in OpenSCAD, with the only external elements being a toggle switch, a momentary switch, and most critically, a set of LEDs. These LEDs play into the second part of the system, the software. The blinking LEDs are positioned so they’ll get picked up by the camera, which is then used to help synchronize the data stored on the SD card with the video. [DusteD] came up with some software that will take the speed and position information from the card, and turn it into PNG files with transparent backgrounds. These are then placed on top of the video with the help of FFmpeg. It takes a little adjustment to get everything lined up properly, but as the video after the break shows the end result is very impressive. This build reminds us of the Raspberry Pi powered GPS helmet camera we featured a few years back, and it’s interesting to see how the two projects achieved what’s essentially the same goal in different ways. Frankencars are built from the parts of several cars to make one usable vehicle. [Jim Belosic] has crossed the (finish) line with his Teslonda. In the most basic sense, it is the body of a Honda Accord on top of the drive train of a Tesla Model S. The 1981 Honda was the make and model of his first car, but it wasn’t getting driven. Rather than sell it, he decided to give it a new life with electricity, just like Victor Frankenstein. In accord with Frankenstein’s monster, this car has unbelievable strength. [Jim] estimates the horsepower increases by a factor of ten over the gas engine. The California-emissions original generates between forty and fifty horsepower while his best guess places the horsepower over five-hundred. At this point, the Honda body is just holding on for dear life. Once all the safety items, like seatbelts, are installed, the driver and passengers will be holding on for the same reason. This kind of build excites us because it takes something old, and something modern, and marries the two to make something in a class of its own. And we hate to see usable parts sitting idle. Without a body, this electric car scoots around with its driver all day, and this Honda doesn’t even need the driver inside. The module in question is a CDM324 24-GHz board that’s currently listing for $12 on Amazon. It’s the K-band cousin of the X-band HB100 used by [Mathieu] in a project we covered a few years back, but thanks to the shorter wavelength the module is much smaller — just an inch square. [Mathieu] discovered that the new module suffered from the same misleading amplifier circuit in the datasheet. After making some adjustments, a two-stage amp was designed and executed on a board that piggybacks on the module with a 3D-printed bracket. Frequency output is proportional to the velocity of the detected object; the maximum speed for the sensor is only 14.5 mph (22.7 km/h), so don’t expect to be tracking anything too fast. Nevertheless, this could be a handy sensor, and it’s definitely a solid lesson in design. Still, if your tastes run more toward using this module on the 1.25-cm ham band, have a look at this HB100-based 3-cm band radio.